The is a new Blogger in town or should I say I have found a new blogger in town. Check out her latest post on No Bull Will be Sacrificed. 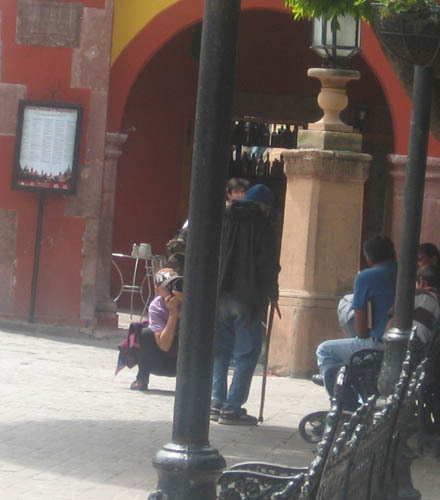 Suzanne La Rosa has an interesting blog about Living in San Miguel. Since she lives here and has met the residency requirement then her comments are valid. It appears from comments I have read and from what people have reported to me that commenting on San Miguel has a residency requirement. If you don’t live here you are not allowed to comment. Or if you do make comments they are dismissed as those of someone who doesn’t live here. (SWDLH). So I am back in San Miguel for six weeks to fulfill part of my residency requirement. But I am unsure of the residency requirement rules that must be completed before you are allowed to comment on San Miguel. I am renting but hope ownership is not a requirement for commenting. I am not living in Centro or those places with a view but in Colonia San Antonio so I perhaps my authority is a bit diminished. 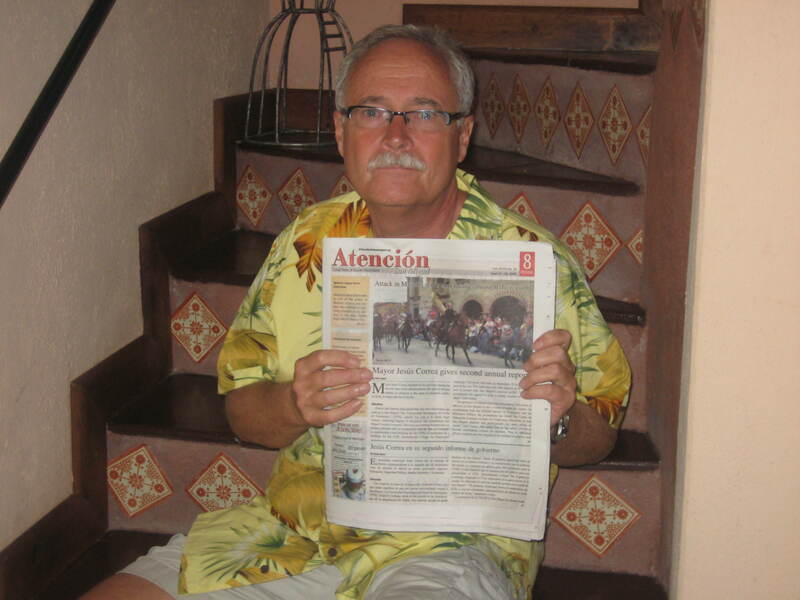 I am moving on Friday to a more Mexican part of San Miguel so I hope that will create some authenticity. I bought a shirt at the Tuesday Market because my bag didn’t arrive on the flight with me. It has since arrived. I have reviewed Warren Hardy’s Level 1 verbs and have used several along with the power verbs. I negotiated with a taxi driver to take me to La Gruta and was so pleased it only cost $1000 pesos. I went to a Feria but alas bought nothing. The highlight of yesterday was being stopped by Caren Cross’ husband who was handing out phamplets for a viewing of her film Lost and Found in San Miguel. Caren was there looking for the K in her name. I was surprised to see her husband as I thought from the film he wasn’t as keen as she was and should be living in the US. went flower picking at the Charco del Ingenio. I hope several of these activities will allow me one or two comments on San MIguel but bottom line I am a member of the blogging gang and if I don’t blog I no longer exist. 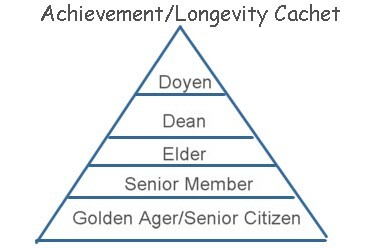 Childhood memories have a way of awakening in later life in another form that may or may not be consciously recognized. Compare these two activities. Discovery Day Camp serves as an introduction to the performing arts. Children spend their mornings taking classes in theatre, dance, music, creative writing and fine arts. Each afternoon, they participate in traditional camp activities such as hiking and local field trips. On Saturday, at the end of each session, campers present a final showcase to which all parents are invited. The Saturday Adventurers go from art to ancient today. First to the studio of Eschwan Winding, a studio envied by many. She paints in all media, in both realistic and impressionistic styles, though her first love is mural painting. She also does decorative pieces such as small screens to be used as table decor. Her home is a real artist’s home, the furniture painted in soft colors, and the view from her rooftop is enchanting indeed. Now to the ancient: the eighteenth-century Hacienda Landeta, owned by the first governor of this area. Note the façade, built by the Otomí Indians, who used their own artistic ability in placing the stones. The inlaid mosaic walkways use different shades of grey stone to form flowers and even a scorpion. We will visit the original chapel, where fading frescos can still be seen. Notice the huge bóveda ceiling in the vast room inside the hacienda; once used to store grain, they say, but now wedding receptions are held there. How grain was separated from the chaff by the wind will be explained. You will wish you had your camera! 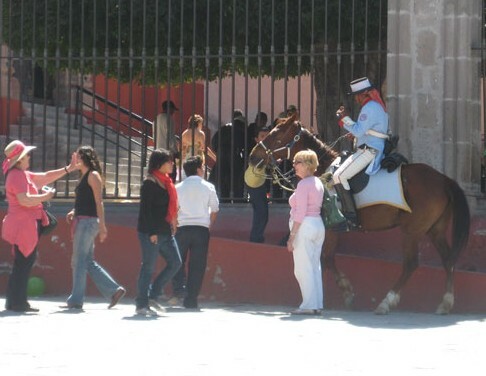 This tour leaves from inside the Jardín, across from the Parroquia, at 10:30am.. The latter is an extension of the former. Saturday Adventurers is a Day Camp for Adults. San Miguel Gangs understand the desire to return to one’s childhood roots and have brilliantly created a series of Day Camps to bring all those feelings back and keep gang members busy and thought free. In addition children with visiting parents can drop them off at one of these camps for the day and they will find adult playmates. Sunday has the best day camp for anyone with visiting parents. The drop off spot is the Biblioteca before noon. The camp costs 150 pesos. You will have no worries about your parent. They are given a name tag where you can write their name and where they are from. If you get their early then they can walk around and try to find either people with the same first name or from the same place they came from. At noon, they are given a Camp Counseller called a Guide and put on a bus to their first Day Camp Stop – a house that they could never afford to own. They will be ushered through the house by the Guide who will tell them what everything cost and how they could never afford it. With the envy factor now revved up it is time to go to the next stop – the art extravaganza. Their goal in building this home was to have a place with plenty of light, comfort and areas where they could enjoy the art brought from their previous homes and the many pieces bought from local San Miguel artists. The purpose is to point out to your parents their lack of taste and complete lack of understanding what good art is. There will be no Poker Playing Dogs (for Jennifer) nor Black Velvet Elvis in these houses. If they come back wanting a six foot red ceramic devil blame Deb Hall. The last stop is the House with a View. Your parents will see a good view to compare with their own bad view. Totally discouraged they will be put back on the bus and taken back to the Biblioteca where you can pick them up. Take them to Starbucks to cheer them up. This day camp offered every Monday, Wednesday and Friday at 10 a.m. 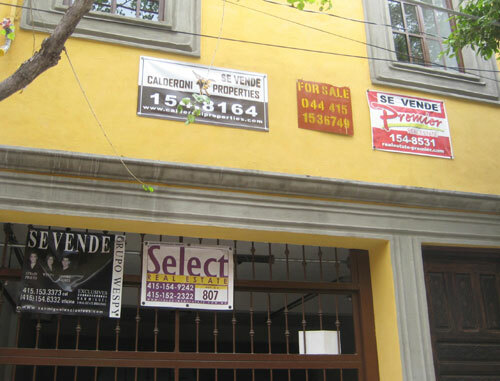 It is a two hour guided fast paced walking tour that leaves from in front of the Parroquia. 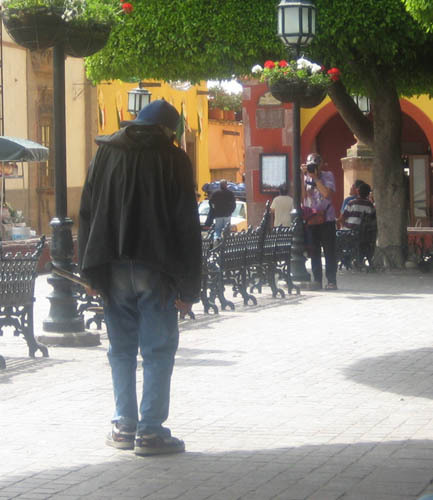 The group is led by a Docent who makes up a different story each time about the places and the people that were important to the history of San Miguel. The naming of the town after Ignacio José de Allende is told in many different ways. 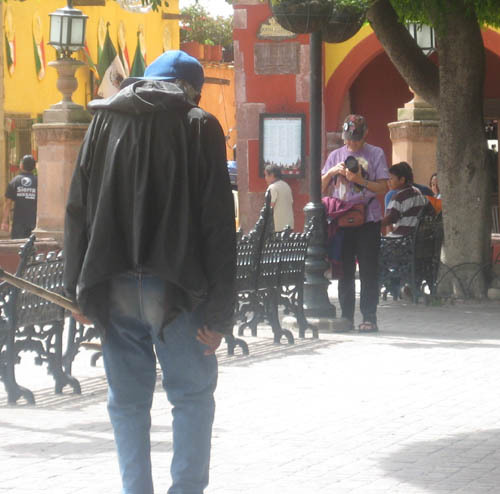 Sometimes he is coming to San Miguel with his pregnant wife around Christmas to pay taxes. Another time the Virgin of Guadalupe appears to him in a field with stories he is to tell. Sometimes he and his buddy Miguel Hidalgo are on a road trip from Mexico City and after a night of heavy drinking discover San Miguel. What is so charming about this tour is that history does not get in the way of a good story. 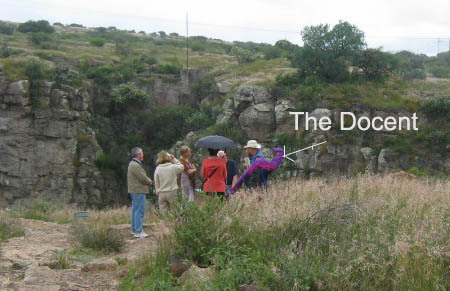 Botanical Garden Tour Every Tuesday, the vice-director gives a two-hour tour in English of the 247-acre park on a hillside above San Miguel. This is a chance to have some fun among the cacti. Mischievous adults have been known to walk fellow Day Campers into a very prickly cactus and giggle. 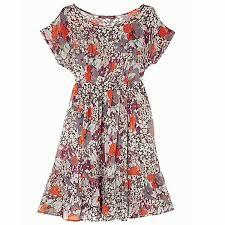 A recent tradition is the Botanical dress. “Big girls” find a flower motif fabric and make it into a mu mu. Taking inspiration from Mimes they stand in the Garden and pretend they are a very large flower. The other flower activities are sure to keep adults busy and vacant. Richard Cretcher, author of Flores Silvestres: A Pocket Guide to the Wildflowers of San Miguel, offers a walk and a pick in the botanical garden September 19 to identify the multitude of gorgeous flowers blooming at this time of year that will look good in your livingroom. The walk starts at 9:30am and costs 100 pesos for nonmembers and 70 pesos for members of El Charco. This is a popular activity, so please reserve a space early by emailing nzerriffi@yahoo.com. Audubon Birdwalk, Every third Sunday at 8 a.m., a group of birdlovers and hunters leaves from in front of the Instituto Allende, on Ancha de San Antonio, to visit birding sites in the San Miguel area. Bring hat, water, binoculars, nets and pellet guns if you have them. The clubhouse at Los Labradores offers total immersion Day Camp for bored Gang Members. There classes in painting, yoga and photography for 450 pesos per month. Great value for Getting Fully Arted. If you take all three there is a 20% discount. 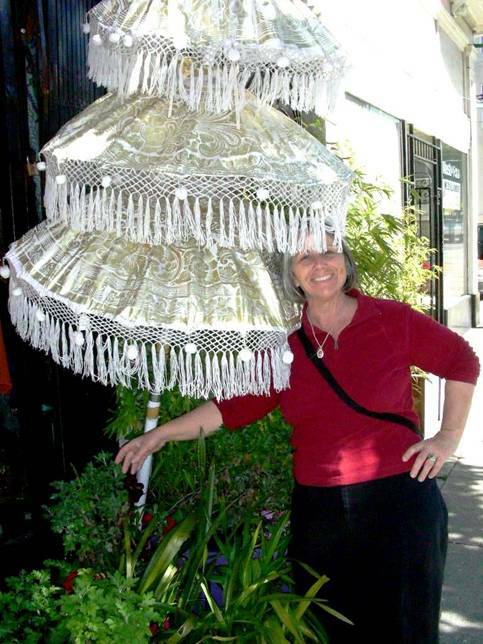 In addition this site offers weekend workshops such as QuantumTouch and Self-Discovery (note this work shop is X rated). Chess in three places. Faux Adults meet Mondays 5–6:30pm in the north portal of the Biblioteca Pública’s central patio. The library closes at 7pm, but Café Santa Ana lets players carry on for another hour or two. And carry on they do – pillow fights, knight toss, tag, hopscotch and rowdy fun. Players with drinking problems also gather at Mamma Mia, Umarán 8, on Thursdays, 5–7pm. Chess players who have read more than two books meet three times a week at Casa de la Cultura on Chorro: Saturdays, 10am–2pm, Wednesdays and Fridays, 5–8pm. This is scary day camp. The UU Fellowship meets every Sunday at 10:30am at La Posada de la Aldea, Ancha de San Antonio 15 and welcomes people of all ages, races, religions, sexual orientation and gender identity. Visitors are invited to attend the service and then join the UUs in the hotel restaurant for brunch. Your parents might come back gay or black so be warned if you send them to this day camp. 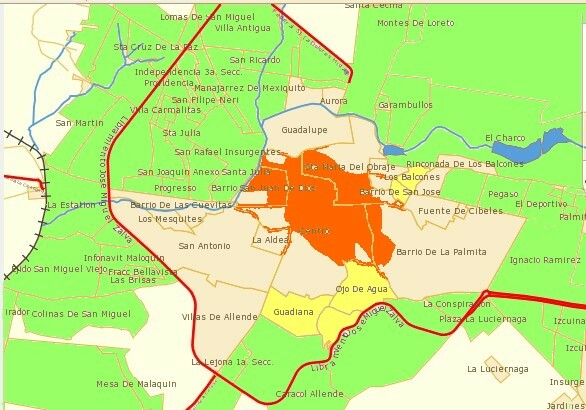 There is something conformable about a Day Camp based on the old service clubs at home so send the old folks to The Rotary Club of San Miguel de Allende-Midday that meets every Tuesday at Hotel Real de Minas at the intersection of Calles Ancha de San Antonio and Stirling Dickinson. This Day Camp is a good introduction to the Arts and Crafts milieu of San Miguel. It’s at the Instituto Allende at Ancha de San Antonio 20. This camp is designed by Gilberto Castillo from Oaxaca and features marimba music. This camp requires no participation other than to listen and watch. Your parents won’t be bringing home any art to put on the fridge but they do get a colored name tag and their faces painted. 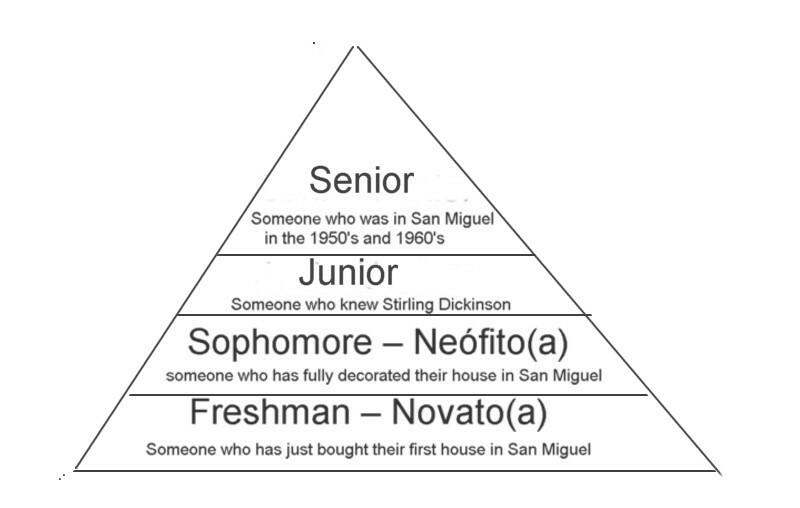 These day camps are not available to the common gang member San Miguel. They are invitation only. 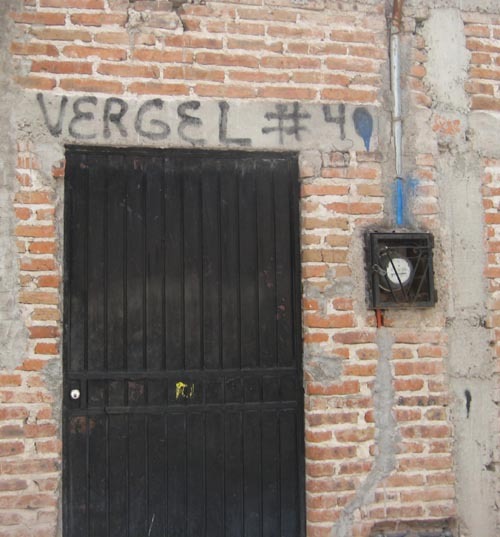 They are the haunted house day camps of San Miguel. 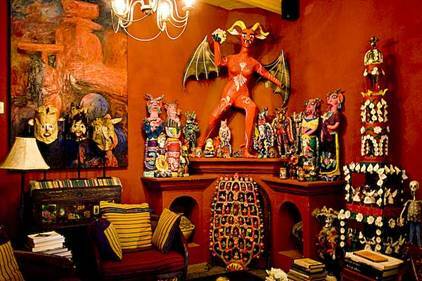 Here is the next one – On Saturday, September 20, Rick and Deb Hall open up their El Cortijo home for an exhibition and sale featuring the fantasy folk art of Los Linares (really scary stuff) . Net proceeds benefit Ópera de San Miguel. (All Day Camps have this disclaimer. 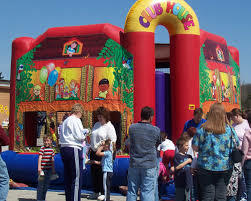 It is not a legitimate licensed Day Camp unless the fees go to some Charity.) There is no charge for entrance into this one-day exhibition except you have to sing a silly song to enter and wear a hat. For additional details, call 152-0663 or stop by Zócalo Folk Art, Hernández Macías 110. No food will be served so have your children prepare a box lunch for you. Deb has an added scary treat at this day camp. She will show you the Devil Room. 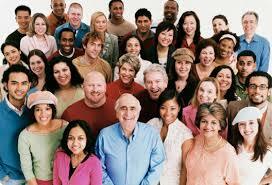 There are so many Day Camps and the following is just a partial lists. Check them out at www.atencionsanmiguel.org. Credit to Jennifer Rose for the idea. The worst sign to see in an amusement park is “Employees Only”. That is what is so great about San Miguel Disney. There are no such signs and if there are they are in Spanish and can be ignored. That means there is no where you can’t go or nothing you can’t participate in. The Churches put on shows every Sunday. 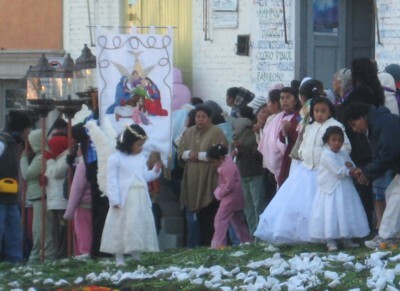 There is usually a wedding or funeral in the Parroquia that can be photographed. This man is rushing to take a picture of a local funeral. The choice of a funeral as the subject matter for a photograph offers proof of the inability to distinguish real from unreal. Does he stand outside his local Funeral Home in Depew, New York and take pictures of funerals? Photographing a funeral is not on the San Miguel Disney Photo Card. It would be interesting to hear his Funeral Story that accompanies the picture. The Photography Gang has helped the San Miguel Disney Gang create the Photo Game Gard. 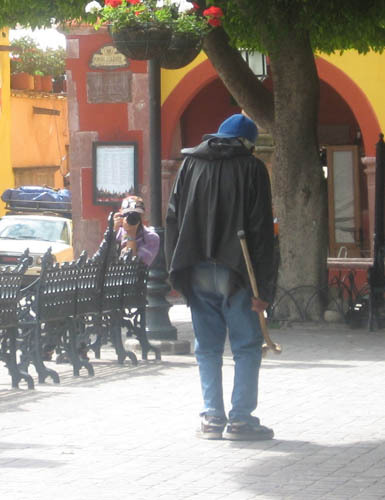 These cards can be picked up at Starbucks and take the guess work out of what to photograph in San Miguel. Each photo is given a point value. Buskers fill the Jardin. 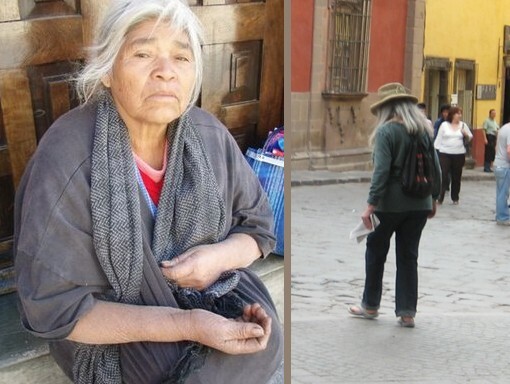 For only a few pesos, it can be a lot of fun to have your picture taken with an old women beggar. But never never go up to a beggar. Let them come to you. 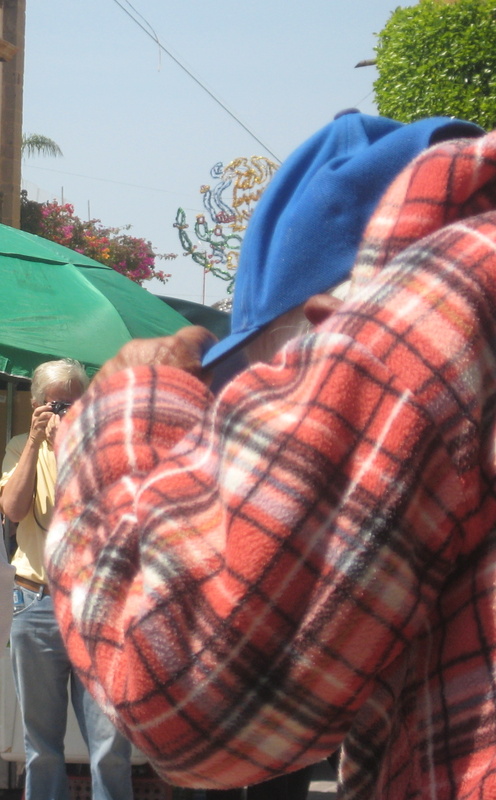 Some gang members in San Miguel look like Beggars and would be offended with being offered only a Peso for a picture. In this picture the woman on the left is the Licensed Beggar. Many buskers dress as small children and sell chicklets or toys. Whatever price they ask, offer half. San Miguel has parades almost every day just like the end of day parade in Disney World. These little angels were the height of fun at something called Juan de Dios that means Don Juan The Swordfighter. 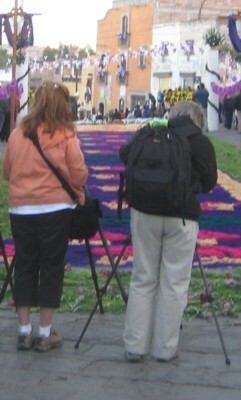 So you can bring your camera and get right into the middle of a festival and be part of the fun. These people stood in the front of the parade and had some fun with parade participants about whether or not they were going to move out of the way and let them pass. Don’t let good manners get in your way for any photo. The whole city is yours to photograph. Fireworks are set off in San Miguel in the evening and the morning by local merchants to bring expats into town to buy stuff. Many expats sit on their terraces each night waiting for the fireworks to announce the latest midnight madness sale in town. In North America we have easily identified themes for parades – Christmas, Victory, Veterans, Easter but pray tell what this Parade is about. No wonder the expats and Tourists think they are in Disneyworld. Are they celebrating the Betty Complex Gang? Is this some ugly grandmother day? What would be the theme of this parade. Given the amount of festivals and parades in San Miguel heads never stop spinning long enough fill with thoughts. It is one Disney experience after another. Time to get personal and be a proud dad. It is strange to watch television and see your son appear on Conan O’Brien. 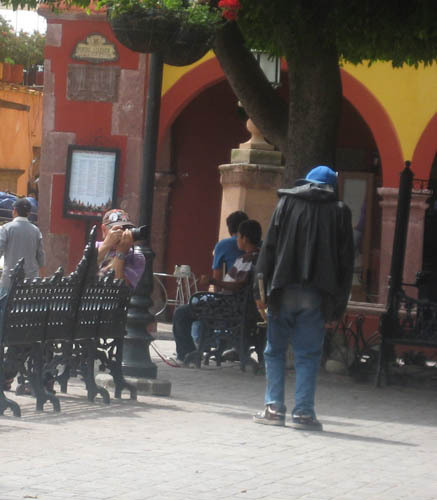 Christian started a blog Stuff White People Like in January while I was in San Miguel. I watched the hits grow exponentially thru February and when I left San Miguel in March and flew to Los Angeles to have dinner with his wife and him, it was the day Christian’s got a book deal with Random House. The book was published July 1, 2008 (Canada Day) and he has been touring Canada and the US for the summer. 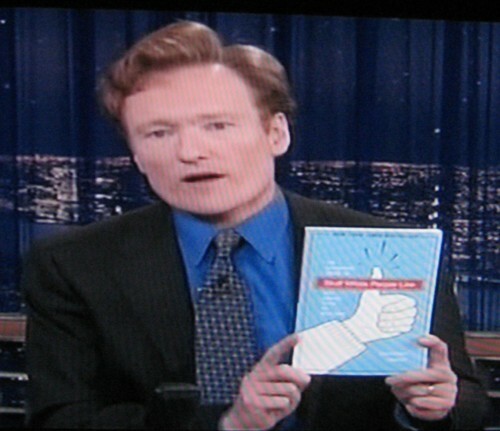 Last night September 5, he was on Conan promoting the book. 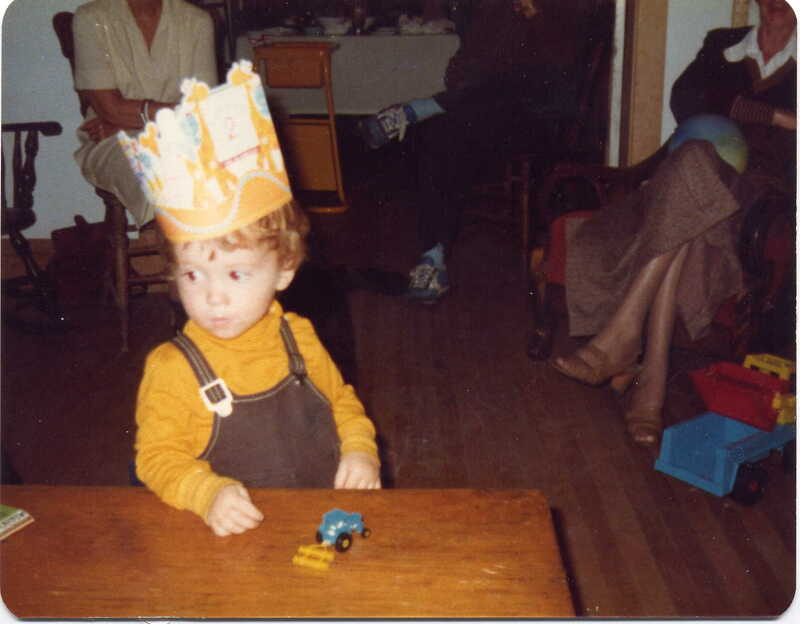 It is wonderful to watch the little person below at his second birthday, grow into the man in the picture above.